You say potatoes, I say pugh! I never quite liked potatoes… Give me a second, allow me to correct that: I always hated them. That is, until I tried these Oven-Fried Potatoes. I blame it in part on our culture; potatoes are hardly an important part of Dominican cuisine – they are mostly used as an ingredient in stews and soups. It doesn’t help much that they are also considered a bland food, ideal fare for babies, the infirm, and little old ladies with no teeth. It took me over two decades and meeting my now-husband for me to learn to enjoy the virtues of potatoes. Danes are as passionate about them as Dominicans are about rice. Having been exposed to the many varieties and countless ways of preparing this humble tuber, made me, if not a raving fan, at least an appreciator. It is unfortunate that potatoes have such a bad reputation here; it is after all an excellent food, one that is cheap and provides us with many important nutrients. A small serving of potatoes provides us with thiamin, dietary fiber, protein, carbohydrates, folic acid, niacin, phosphorous, magnesium, calcium, zinc and iodine. Potatoes also have a whooping 80% of the daily requirement of vitamin C, more potassium than that found in bananas and more antioxidants than most vegetables. To take better advantage of the nutritional richness of this tuber, whenever possible the potatoes should be cooked with the skin intact so that they retain the nutrients that could be lost during cooking. The skin itself is a great source of soluble fiber. I have no intention of turning anyone away from our beloved rice, but it is always nice to be open to new things. And to help you ease your way into the world of potatoes I give you one of my favorite potato recipes. Oven-Fried Potatoes Recipe: Much better than deep-fried potatoes and much less fat. 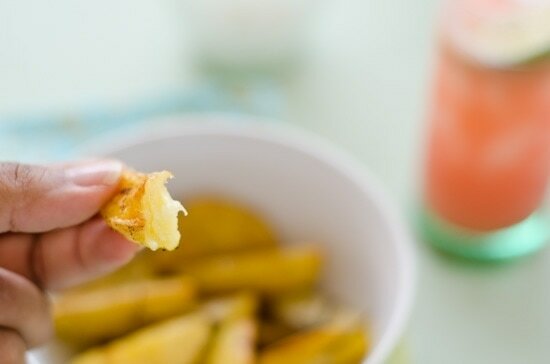 These delicious oven-fried potato wedges go great with roasts. Boil the potatoes adding the salt and the garlic to the boiling water. The potatoes should be soft but firm. Once they are tender but firm remove from water. While the potatoes are boiling, pre-heat oven to 450 ºF [230 ºC]. Mix in olive oil, dill (or rosemary) and paprika. Pour on the potatoes, add salt and pepper (half a teaspoon of each) and mix everything well until the potatoes are coated in oil and herbs. Try to keep the wedges intact. Spread over an oil-coated or non-stick baking tray, keeping the wedges as far apart from each other as possible. Bake in the oven until the wedges are golden brown. Take them out of the oven and let them cool for 3 to 4 mins. Serve hot. You can use either dill or rosemary, the taste is different but both options are very good. I'm Dominican, 23 years old and I been living now 5 months with my Russian girlfriend, which is crazy with potatoes, it's like rice to them also. I found your recipes to see if I can add something new to the potatoes menu!